Swing Thumbdrive - Dance lessons and reviews, radio interview with Frankie Manning, soundies collection, playlists and more! Probably the best gift for any swing dancer/lindy hopper ever. This 32G thumb drive is filled with swing dance lessons and review videos, a rare radio interview with Frankie Manning on NPR, a HUGE collection of soundies (music videos from the 1930's and 40s of big bands), favorite swing playlists, and so much more! This collection represents over 20 years of work. Come dance the night away into the new year as we party like it's 1929! 9:00pm-12:30am: Dance to great swing music all night and into 2019! Mini-dance lessons each hour in Charleston, East Coast Swing, Lindy Hop, Balboa, and Collegiate Shag! Join us just after midnight for the first Shim Sham of 2019! $20 adv. includes dance lesson, dance, cider toast, and food. Dance only passes will available if space available. Our dance class card includes 20 group classes, a CD for practicing, and one 15 minute mini-private lesson (cards can be combined for a longer private lesson)! This package includes 3 private lessons. Holiday special available until the end of 2018 only. Can have up to four people in lesson. 4 hours of professional DJ services for weddings and events plus group dance lesson at event for guests (save $400). 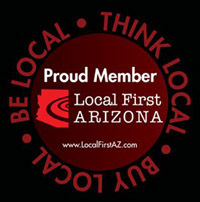 The AZ Lindy Hop Society is a proud member of Local First Arizona. We encourage shopping locally to support our local economy, schools, and locally owned businesses. We know you have a lot of options so thank you for considering shopping with us. Every time you make a purchase, you’re exercising power of choice. The choice is yours. You have the power to strengthen & enrich your community. Thank you! We know how difficult it can be to find the right gift so we have great specials this holiday season. Giving the gift of dance can be a gift that brings someone joy for the rest of their life. Stinkweeds -music (Online, CDs, vinyl) and more! Bookman’s – Six AZ locations – books, music, instruments, & more.